The search for Britain’s Best Classic Destination is over, with Lakeland Motor Museum being crowned the winner. After originally being nominated as part of a 30-strong long list by Practical Classics readers and Footman James clients at the start of the year, Lakeland Motor Museum made it to the top 10 shortlist after a public vote. From 6th May – 12th May 2018, Footman James and Practical Classics then embarked on a UK wide adventure to visit the top ten classic destinations as were voted for by the public. The route included; The National Motor Museum, Llanberis Pass, The Kelpies and Haynes Motor Museum, just to name a few. But, there could only be one winner! 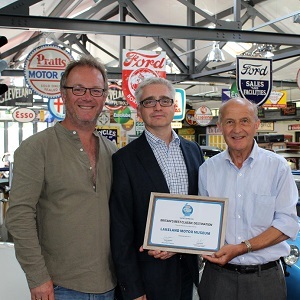 On Tuesday 22nd May, the winner was announced with Footman James and Practical Classics visiting Lakeland Motor Museum to present them with the award. Whilst there, Chris Lowe gave a tour of the museum, with extra insight on the classic vehicles on display. The museum is home to over 30,000 fascinating collections and exhibits that trace the development of the motor industry throughout the twentieth centre including; classic bikes, classic cars and automobilia. The museum is also celebrating its 40th anniversary this year and in the last four decades has attracted over 1.5 million visitors. With its unique collection of 30,000 exhibits and over 150 motorbikes, it’s truly a worthy winner.